Above: Michelle Otero. Photograph by Steven St. John. MICHELLE OTERO HAS LONG LOVED to show people the poetry that surrounds them every day. 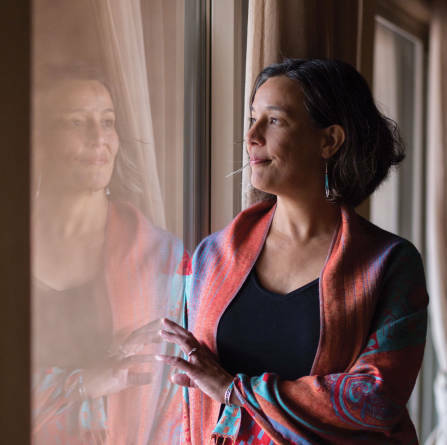 As Albuquerque’s newest poet laureate, a role she will hold for two years, she steps onto a bigger platform to do so. Raised in Deming, she earned a bachelor’s degree in history with honors from Harvard University. It took her a while to find her way to writing and to see that poetry was always there. She recalls hearing dichos, sayings and proverbs that usually rhymed. “I was surrounded by people who used language in really beautiful ways,” she says. After graduation, she did a two-year volunteer stint in Belize, where she read constantly and journaled daily. She eventually completed a master’s in creative writing at Vermont College of Fine Arts and was awarded a Fulbright scholarship to create writing workshops in Oaxaca, Mexico, for women who survived domestic and sexual violence. Her book of essays, Malinche’s Daughter, grew from that experience. She has begun a Walk with Poets project to encourage people to write about the bosque along the Río Grande and will edit an anthology of that work during her term as poet laureate. I like New Mexico because it’s real, because the only way people have managed to live here over hundreds of years is by cooperating, because we are complicated and complex. I like New Mexico for the light, the smell of rain, the way the sky reminds you of your place in the world. Deming taught me the value of community, in the best sense. There are people watching out for you who are going to take care of you. It took me a long time to realize how challenging Harvard had been for me. There was a lot in that experience that was really beautiful, plus amazing, incredible friendships, and just the doors that it opened, along with opportunities. And then there was a part that was just wounding. I felt like I couldn’t mess up, like If I mess up and this doesn’t work, then they’re never going to let anyone else in. I’ll be the last Chicana they let in. I’m so grateful for having the experience of living in Mexico, because I just remember so many nights or special times of year, like Independence Day or Day of the Dead, and inevitably someone would pull out a guitar and people are going to start singing and everybody sings. Everybody dances. Everybody will say a few words. It feels as if there is a reverence for poets and painters and artists and there’s a recognition that it’s for everybody. Malinche’s Daughter really combined my love of writing, my love of facilitation, and also my belief that art heals people. Being poet laureate feels like: How do I expand into it? Because it just feels like the possibilities are so big. It feels like a real privilege. I’m excited to be the first poet laureate under this administration, because it feels like there’s real possibility in this city. I get to be an ambassador for Albuquerque and for poets and artists in Albuquerque—and, because my project is all about the bosque, I’m an ambassador for the bosque. It’s all about relationships. So how are we in relationship with this beautiful, natural gift we have here? How did we get lucky enough to have the world’s largest cottonwood forest? I write a lot about women and being a woman and women’s bodies and what happens with our bodies and how that relates to climate change and the current political time. So even though I couldn’t sit here and tell you in a linear way how those things tie together, I can do it in a poem. So when I’m churning like that, it’s really easy to be in my head all the time, which is why I wanted a project that was putting me in nature, because it will ground me in a lot of ways. It’s going to give me the gift of being among the trees and being close to the river, but also there are all the metaphors in the bosque. You could go 12 different times and find 12 different metaphors—or find 12 different meta-phors on the same walk. The Paseo del Bosque Trail, which stretches for 16 miles through Albuquerque, makes for a lovely walk year-round. Read more: Stephanie Oyenque, the cultural education specialist at the Indian Pueblo Cultural Center, in Albuquerque, wants you to take control of your story.